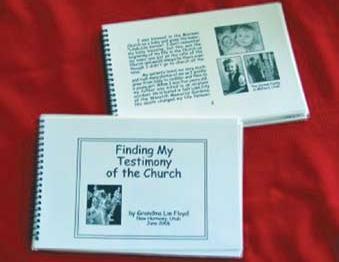 Here is an excellent example of writing down and preserving your personal testimony for family members to enjoy. Read what my AuntLin did to preserve her conversion story, in an article she had published in Deseret Saints Magazine, April 2009 Edition. It's an excellent exercise in pondering your own faith in Christ and how that has affected your life. I hope to do this project as a gift to my children. thanks for the free publicity...I also did it in color and printed it off on my own printer to save costs.